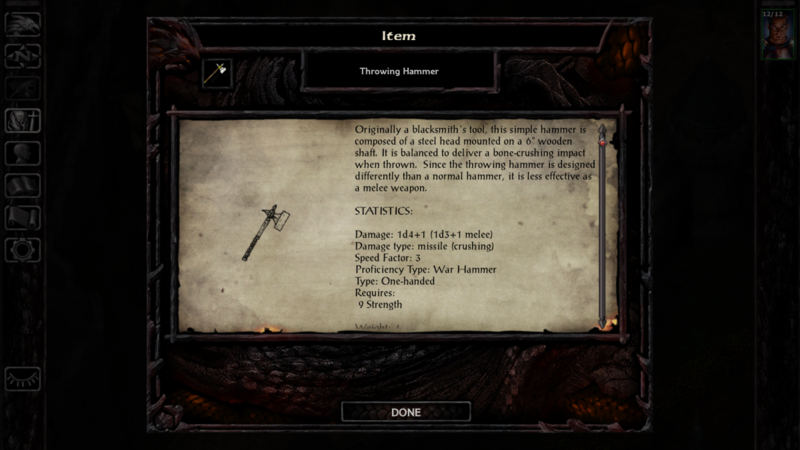 This mod is awesome - but where can I find the returning throwing hammer supposed to be sold in shops? 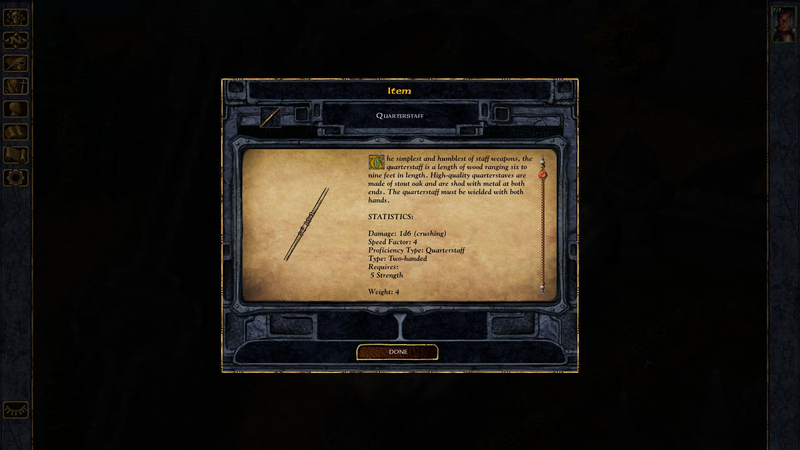 I believe I have found all other special magic items added by this mod, but not that one. "I've heard people complain that the game [the new Prince of Persia] is too easy, which seems odd to me, since I died more times than The Nameless One in a smoothie-maker." The easiest way for you to find it may be to use NearInfinity and search for references to T-HAMM01.ITM. With a bit more information about which game you are playing, I can give you a list of possible locations, or you can look in the TP2 yourself. The code comments are helpful. Nope. I'm sneaky like that. I liked to think randomization gave the game more replayability value, but in reality, it might just give it more "WtF" value. I just installed this on BG1:EE 2.5.17 w/ SoD, and the throwing hammer's description image is messed up. It appears as if only a quarter of the image is present. Looking at it in NI, it seems that T-DHAM03.BAM is a 4 frame bam rather than a one frame - perhaps this is the problem? Also, any idea why the text is being progressively scaled smaller in the description? Other item descriptions don't do that, including those of comparable length. edit: to muddy this further, the description .BAMS in the /hammers/bams folder display correctly, and NI shows them as having a single frame. Simply copying those into my override folder fixed this. Also, when I --change-log'd the offending .BAMs, only setup-hammers has touched them. Edited by agris, 13 November 2018 - 06:18 PM. If it helps, --change-log on the above item "T-HAMM03.ITM" shows that Tweaks Anthology v7 also touched it, with the Alter Weapon Profs (IWD + styles) and Increase Ammo Stack components. Sad panda... Could you please post the Setup-hammers.debug file also? I promise I'll add it to my to-do list, right after installing the latest patches from Beamdog. If I haven't responded in a week, feel free to poke me again . Could you please post the Setup-hammers.debug file also? Sure, see attached. This omits the spiritual hammer component, since I install that after a lot of other mods tinker with the spells, and it doesn't involve the relevant bams. Why that font is only applying to part of the text, I have no idea but I don't think there is anything I can do about it. As for the description image, as you say the t-dham03.bam that comes with Thrown Hammers is a single frame and seems to display fine. However, when the darker SoD theme is detected, t-dham03.bam is overwritten with a copy of bddham03.bam to match the darker theme. Looking at your DEBUG file, this was the case for you. As can be seen in my screenshot it seems fine in my game. Maybe a mod changed it in your game? Would you mind running a change-log on bddham03.bam and mos1034.PVRZ? Thanks for looking into this, A change log shows that nothing has affected either file. I checked a fresh copy of my BG+SoD, that I ran modmerge on, and bddham03 & 04 are both 4 frame images, carved up such that each frame is a quarter of the image. It seems as if the problem is in either SoD, or the modmerge tool. Which begs the question: why does your image show correctly? Are you using something other than the 2.5.17 steam release? Edited by agris, 18 November 2018 - 10:47 AM. I'm using SoD v2.5.17.0 directly from Beamdog, no modmerge required. I've heard there are issues with the BGEE incremental patch on GOG, but don't recall reading about any issues with Steam. I could ship my own version of these description BAMs with the mod, but it would burn an entire PVRZ file for each one, and there is a limited number available so I'd rather not. I could try converting them to BAM V1 instead, but if the V2 is using the alpha channel, the results won't be equal. I'll try to investigate the options a bit more. Edited by Sam., 18 November 2018 - 11:22 AM. The most recent update should hopefully resolve the description icon issue on SoD v2.5 on Steam. It should also (hopefully) add compatibility with lefreut's Enhanced UI (BG1EE skin) mod, but I haven't actually tested it. It should also (hopefully) add compatibility with lefreut's Enhanced UI (BG1EE skin) mod, but I haven't actually tested it. It works, thank you Sam! is this mod compatible with item revisions ? I've never used item revisions, and there is no code in the mod specifically tailored to IR. Is it incompatible in any critical way? I doubt it. Beyond that, I really don't know. Yeah, who cares. Heh, but seriously, I think I looked at IR for what there was during the first few releases of Hammers and tried to account for it if there was anything necessary. There might have been something of that nature with Thrown Spiritual Hammers (because at the time anyway, IR overwrote rather than patched all resources). It might be in the readme (which is where these days?) if there's an install order issue. Edit: I should note that what I said might apply to Spell Revisions, not Item Revisions. There's probably no compatibility issue with the latter since Hammers installs its own named resources. Edited by Miloch, 16 February 2019 - 01:17 PM. Well then... "This mod should go after other mods that add or change hammers (including the Spiritual Hammer spell) and before final "biffing" routines. It should also go after mods that overwrite rather than patch game resources." That means you should be fine as long as you install Hammers after Revisions. Edit @Sam. : Regarding the PST incompatibility reference, could this theoretically be compatible with PST:EE? Haven't really looked at it, sort of doubt it (at least not without a fair bit of work), and it's probably not high priority. But you've probably got so many other things on your to-do list, why not add another? Edited by Miloch, 20 February 2019 - 07:16 PM.